On the History in Color Facebook page, artist Dana Keller presents a series of colorized historical photographs, helping to "remove that barrier between the past and our modern eyes, drawing us a little bit closer to the reality in which the photo was taken." 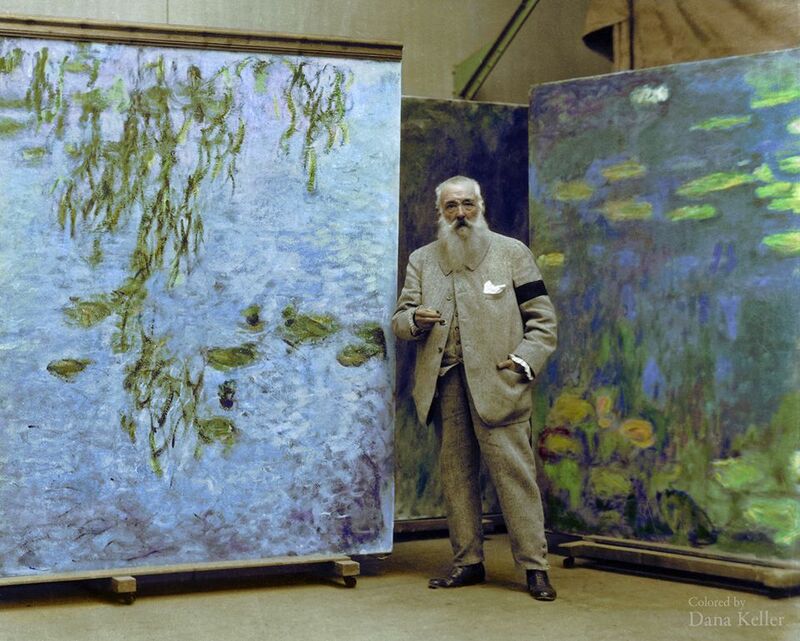 In the example above, we see impressionist painter Claude Monet standing next to paintings from his famous Water Lilies series. Given what he did with color in his paintings, it seems only fitting that we should see the man himself in color. If you care to see Monet painting in his garden in Giverny (circa 1915) in some impressive grainy black and white video, click this link and take a little historical journey with us. More colorized historical photos can be viewed here: Colorized Photos Bring Walt Whitman, Charlie Chaplin, Helen Keller & Mark Twain Back to Life.